showmeamazonas.com | a homemade bamboo-raft down the mighty Amazon River, unsupported. Welcome to our Amazon Raft Adventure ! This is the story of two guys who ventured deep into the Ecuadorian jungle where they constructed a bamboo raft and floated for 4 months unsupported through the vast wilderness of the Amazon Rainforest on the largest river on our planet. Peycho and Henrik spent a month constructing the raft, on their own design ideas and quickly after they departed, they met Misha, who became a part of the raft. Throughout the 4 months, they lived out their intrepid adventure, sucking up everything that was thrown at them: A wild and unpredictable river, violent crashes, a somewhat uncontrollable raft, virgin jungle, indigenous tribes, tropical rainstorm that took their roof and a fearful presence of river pirates. This website portray the adventure with a blog, photos and description of the raft. The Book: We drifted into the Amazon. 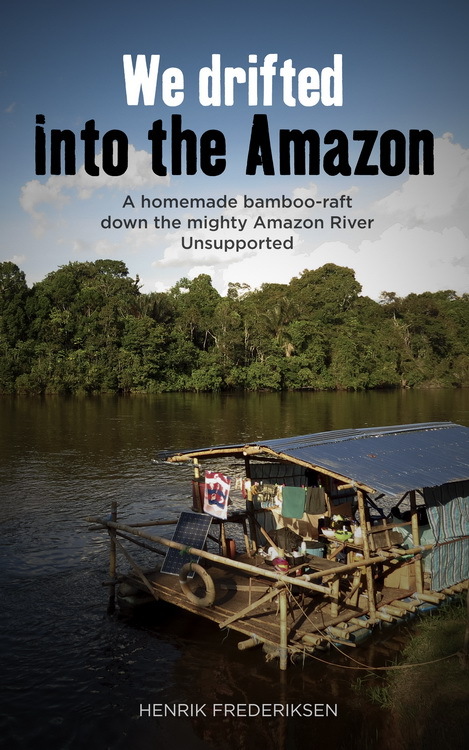 – a homemade bamboo raft down the mighty Amazon River, unsupported. Hi Guys, Keep going! Great to follow you progress. I was wondering where your bicycles are now? Peycho brought his bicycle with him, it is on the raft. He will continue his bicycle journey from wherever we end up. Henriks bicycle is in Quito, Ecuador and he will return to his bicycle and continue up through the Americas once this adventure is over. Smiles! Hey guys! We’re here at Santis house in Quito! He told me about your project! So cool! We have cycled Centro America to South for the World Cup in Brasil.. We are planning on taking the Napo to Peru then Amazon to Belem then continuing the cycle trip to Natal for World Cup matches! Super psyched on the project wish we had the time to do something similar! Enjoy! The Napo River was a great section, likely the part of the adventure that I’ve enjoyed the most. You should have a great time going down the Amazon. Public boats are rare on the Napo, but from Iquitos to the Belen, it will be easy to find transport. Make some stops underway and roam around some of the magical places on the river: Pebas, the tri-border, Jutai, Tefe or wherever possible. And best of luck with the World Cup! Should you maybe have an email address for Santiago? I need to inform him about my return. Awesome story! Loved following Henrik on his worldonbike.com and now he is walking from Canada to Mexico… I once sailed with Henrik from Sydney to Thailand – he is a fantastic guy and a true adventurer. Great jorney, Henrik and Pecho! Hello from rio Napo!